Which Hunting for the Missing 36,000? PROCTOR: I never knew until tonight that the world is gone daft with this nonsense. HALE: Nonsense! Mister, I have myself examined Tituba, Sarah Good, and numerous others that have confessed to dealing with the Devil. They have confessed it. PROCTOR: And why not, if they must hang for denyin' it? There are them that will swear to anything before they'll hang; have you never thought of that? Lo's comment came one day after the Presidential Office pointed out that from 2000 to 2008, only 6.76 percent of total received official documents had been properly filed. The recently-concluded two-year investigation found that during the eight years of Chen Shui-bian's presidency, 17 senior officials' offices had received a total of 38,924 documents, according to a statement released by the office on Tuesday night. Officials who worked at the offices under Chen and are now under investigation reportedly include former Vice President Annette Lu (呂秀蓮), former presidential secretaries general Chen Che-nan (陳哲男), Yu Shyi-kun, (游錫堃), Chen Shih-meng (陳師孟), Chiu Yi-jen (邱義仁), Su Tseng-chang (蘇貞昌), Mark Chen (陳唐山), Ma Yung-chen (馬永成) and Yeh Chu-lan (葉菊蘭), among others. These officials could have violated several laws, including the National Archives Act (國家檔案法), the Classified National Security Information Protection Act (國家機密保護法) and the Decree Governing the Transfer of Documents of Civil Servants (公務人員交代條例), according to the Presidential Office. Take careful note of the first paragraph I have excerpted there: this comes directly from the Presidential office. The DPP pointed out its obvious electoral use -- coming a year before the Presidential and legislative elections, meaning that prominent DPP politicians will be "under investigation" during this critical period. Is that the reek of panic among people at the top of the KMT? DPP officials point to the obvious political motivation. They also observed that many of the "missing files" may well be items that do not require filing, such as personal letters. Finally, a prominent official swept up in the investigation observed that only high officials are being pursued by the investigation -- the junior officials are not being looked at. Of course ranking officials don't fetch and return files themselves -- that is for peons. But the peons aren't being pursued. This whole thing stinks. What it really means is this: for the next year prosecutors are able to, at will, enter the residences of DPP officials and search them, during a critical election year, and basically take whatever they want. Recall that a key "effect" of the assault on Chen Shui-bian was giving prosecutors a look at who was donating to the DPP. After all, that it took the Presidential Office nearly three years to realize that a large bulk of official documents were missing speaks volumes on the Presidential Office’s efficiency — or lack thereof. Add the fact that in April 2008, Chen set up a seven-member handover task force to take charge of the transfer of power procedures, assisting then--president-elect Ma’s team and answering all their queries and requests concerning information on national defense, cross-strait relations and foreign affairs, among others. Tsai or Su for 2012? The government shall establish plans to gradually achieve the goal of becoming a nuclear-free country. The government shall also strengthen nuclear safety management and control, protections against radiation, and the management of radioactive materials and monitoring of environmental radiation to safeguard the public from the dangers of radiation exposure. Tsai’s suggestion for a nuclear-free homeland does not call for an immediate halt to construction of the Fourth Nuclear Power Plant or closure of the three plants that are in operation. Instead, as halting construction would be more expensive than completing it because of breach-of-contract costs, Tsai proposes that construction should be completed, but that the plant not be operated commercially after completion. Also, the three existing plants would not have their operations extended when they reach the end of their operational life by 2025. Tsai's bold call appears to have caught her rival Su Tseng off guard; he came out a more conservative position, without a timetable. But the swiftness and surety of her thrust shows that she has smart advice and is not afraid to take the right position. With the two emerging as the leading candidates as observers had long felt would be the case, more than just a primary is going on. Su is really the last lion of old martial law generation, along with former Vice-President Annette Lu, who hopefully will fade from politics soon, and the DPP Mayor of Kaohsiung, Chen Chu, who will never operate at the national level. Su helped co-found the DPP and was one of the lawyers for the Kaohsiung 8. Tsai represents the next generation of DPP leaders. Generational transition is symbolized by this primary. Bruce Jacobs, the well-known academic who has made a career out of studying local politics in Taiwan argued in the Taipei Times earlier this week that Su was the ideal candidate. He points out that (1) Su is a proven election winner; (2) Su is a proven and able administrator; and (3) polls have Su doing better against KMT President Ma than Tsai. Jacobs also says that Su will do better with swing voters, whom he claims constitute a fifth to a quarter of the electorate. In 2008, the DPP vote total fell from 50 to 42% as swing voters switched away from the DPP. Maybe 20-25% of the voting population claims to be a swing voter -- though I suspect a lot of those "independents" are simply DPPers being quiet about allegiances. The fact is that in the 2008 only 8% of voters "switched", accounting for Ma's 16 point victory. Perhaps the other 12-17% of the swing voters canceled each other out switching back and forth, but my own suspicion is that the swing vote is roughly half what Jacobs says it is. Consider that the DPP's Chen Shui-bian took 39% of the vote in 2000, with KMT Lien Chan and PFP Soong Chu-yu taking 61%. Do the math -- it took only a 11% swing to bring the election to Chen at 50% in 2004. The 2008 swing was just 8%. The "swing" vote masks the larger, very longterm trend of voters becoming Green over time as people become more comfortable voting for the DPP. According to cable news station TVBS’ survey, if the election were held now, Tsai would receive 34 percent of the vote against 41 percent for President Ma Ying-jeou (馬英九). Su would take 36 percent against Ma’s 37 percent. A poll by the Chinese-language China Times showed that Tsai would lose by 6 percent with 30 percent of the vote, with Ma taking 36 percent. Su would get 32 percent to Ma’s 38 percent. The Chinese-language Apple Daily suggested that both Tsai and Su have higher ratings than Ma. Tsai would receive 49.4 percent against Ma’s 34.3 percent, while Su would get 51.6 percent to Ma’s 29.8 percent. The China Times poll went a step further, comparing Tsai directly with Su. The newspaper said 32 percent felt Su was better suited to run for president, while 27 percent backed Tsai. Meanwhile Sophia Solivio fired off a riposte against Jacobs' position in the Taipei Times, arguing that Tsai was the better choice. She contended that the flip side of Su's able administration is a remarkable lack of imagination and leadership in policy initiatives. During the announcement of his bid for the DPP presidential nomination, Su insisted “Taiwan has been floating in the open sea” and “we need a strong leader during times like this, a helmsman who is of strong will,” but on cross-strait issues, Su also mentioned, “there is no need to advocate new and novel ideas or policies.” Will Su’s lack of innovative ideas transform Taiwan into a country “where everyone has a smile on their face”? Silvio also argued that Tsai has repaired and reinvigorated the DPP, and appeals across generational and class lines just as Su does. Tsai is also endorsed by oldtime independence activists like the awesome Su Beng. Despite the polls, Tsai might actually be the better candidate, for several reasons. It is quite true that Su is a proven administrator, but as the election of Ma himself shows, the public cares little for that qualification. Moreover, Su's long experience as County Chief of Pingtung and Taipei County -- note that he is popular in both the North and the South -- actually counts against him, for he could easily be spun in campaign propaganda as a wheeler-dealer with a finger in every pie. Having been in charge of many infrastructure projects, no doubt KMT operatives could dig up an alleged failure or two to throw at him. Tsai's lack of experience in this area actually helps in this regard, she has no skeletons, real or imagined, rattling around her non-existent administrative closet, although her lack of experience could become an issue. We're not into the election season yet so the KMT has not opened up on Su. Further, voters in Taiwan respond strongly to social class issues. They like to vote for people from the class that they consider fit to run the nation. Chen Shui-bian's roots in a farming town in Tainan were always used to demonstrate a lack of class, at least to KMT voters. Tsai, on the other hand, comes from a wealthy family and has an overseas education, something many educated voters in Taiwan can identify with. Su has a strong Taiwanese flavor (which I love, along with his basso profundo speaking voice) that many light Blues will find offputting and "low class." He was educated at NTU, impressive to be sure, but lacking the social class markers that a foreign education conveys. Tsai is nearly a decade younger than Su -- elections are endurance tests, and relative youthfulness is an asset. Finally Tsai has another crossover appeal: she's of Hakka origin, born in Fangshan in Pingtung County. Hakkas are an important pro-KMT voting bloc, which the DPP is trying to pry from the KMT grip. Manila gets KittyHawked (DEF): serve Beijing by handing over 14 Taiwanese for prosecution? Thanks, and now we'll execute three of your nationals, even though you said you could prove them innocent. The sad thing is Manila is unlikely to learn any cogent lesson from this. China also buzzing Japanese ships with its helicopters again. Way to keep that goodwill up in Japan! Taiwan's GDP to fall marginally from Japan's troubles. Is Taiwan ready for the coming tourism boom? You bet! The government isn't, however. Lao Ren Cha with another great look at the low marriage rate among femmes here. What's being collected out there on the blogs today? Is winter ever going to give up its grip on Taiwan? CWB says yes, finally. This winter has been tenacious and I am thoroughly sick of it. Drew on the Taipei bike trails. Taiwan still hasn't imagined the cycle as a commuting device. Taiwan Air Power on Dadu Mtn Airbase. 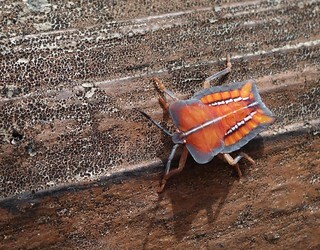 AsiaEye with under the radar news. Steve "Sisyphus" Crook is correcting Kaohsiung. Climbing He Huan Shan on a road bike. Man these guys are fit fit fit. Hsu Hsin-liang, former DPP chair who went over to the KMT, like Shih Ming-teh, now enters DPP presidential race. It's a good way to make money, eh? How many times have we heard this? Taiwan firms headed home since China is too expensive. Taipower is totally committed to nukes. So is economic bureau. A China Post editorial on femmes not wanting to get married. It's incredible that despite the failure of marriage in so many instances, the lack of enthusiasm females here show for it, and the general unnecessity of it for many members of both sexes, why no one ever concludes that the institution itself needs changed. It's marriage, not people, that is failing here. Note the Confucian core values President indexes as "Taiwanese." US student's collection of color photos of the railroad in Taiwan 1966-1970 makes big splash. I'd love to read this. SPECIAL: Photos from a lost Taiwan: 1973 in Hualien. Way cool: India has stone tools 1.5 mya. Here is the second installment of my continuing saga of travel in Pingtung County, courtesy of the county government. Yes, four more days under the pineapple sun of southern Taiwan. This time I focused on history as the weather in the mountains refused to cooperate. Friday and Saturday night I stayed at this excellent little B&B in Jiayi Village just down 185 from Shuimen town (清廬民宿, 屏東縣瑪家鄉佳義村1鄰泰平巷5-28號 08-799-0311/ 0921-586-661). The owners consisted of a Paiwan matriarch and her Hakka husband, retired principal of the local elementary school. The house above can sleep six in comfort and is done up in aboriginal stone plate style. It is surrounded by grass and flowers. The owner told me that the stones have to be turned over annually, which is troublesome and expensive, so they concreted it over. The inside is full of atmospheric knick-knacks, an eclectic collection of artifacts, very enjoyable. $1500 NT a night. Incredibly nice people too. Saturday morning I blazed down 185 to enjoy a magical history tour of Pingtung with Catholic churches, Hakka culture, and Japanese military infrastructure as my goals (map of Saturday's route). 185 is entirely flat and an easy ride. 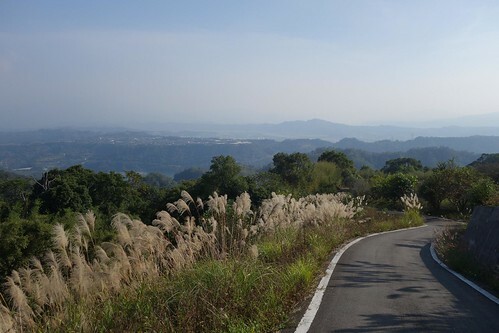 The road runs N-S along the mountains and offers enjoyable views of the mountains right over your shoulder, and access to the rising tourism culture of the area, including the local coffee. In front of a local military base I turned towards the Basilica in Wanjin, a famous local landmark. Cars are lined up to pick up sons at the base on a Saturday morning. Some locals, waiting. Seeing that I stopped, they came over to have a chat. Taiwanese are always super friendly to people on bikes. 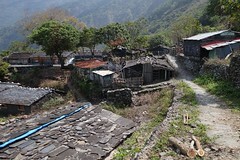 This and the Hakka village I was aiming for are located in Wanluan township. As you can see from the signs, the township does a wonderful job of guiding you to its many sites of interest. The amazing mural in Wanjin. Next to the Basilica is Art Coffee, with decent coffee and good food. Have the bagels with cheese and tomato, or the beef rolls. The melange of iconography in the area offers moments like this, where a Mary statue and an earth god shrine are found opposite each other. ....to the Hakka village of Wugou. Wugou was designated an official historic village in 2008 and many of its buildings are old. A number are under renovation. This interesting old building used to be a school. I was so taken with Wugou that on Monday I returned to grab some more pictures. It was then that I met Mr Jhou, recently retired after being a factory manager in Nigeria. He spoke excellent English, and told me that he had settled in the town to learn about it. We had a walking tour together. They still give old school haircuts in Wugou. An old house in the village. Some of the altars in these buildings appeared to be quite historical. One of the houses being renovated. A carved dragon supports the roof. A small factory in the town. Mr. Jhou took me out to the Half Moon Pond. Here are nearby irrigation works. The pond is strongly defended by geese. They can insult me all they want; someday I will eat them. Back on Saturday, I stopped to confirm my destination with a friendly policeman. Then it was back to 185. Past the pineapple fields to Fangliao along the ocean. Fangliao has an old American connection to the Rover Incident of 1867. 185 stretches into the distance. It is a truck route and the pavement is only in fair condition. It is especially bad on the southbound side. A common sight: pineapple pickers. I arrived in Fangliao in that twilight period after 10 between breakfast and lunch, and thus resolved to eat lunch in Jiadong. In Jiadong I passed this statue of Mary Guanyin on my way to the famous Hsaio family residence, a large, restored 19th century house. Posing in front of the Hsaio House. The house contains numerous rooms with displays, antiques and photographs. Well worth a visit if you are in the area ($50). The town also contains many old houses. Another view of the entrance. Note the building next door, which appears to date from before WWII. Alas, it is not being restored. My next project was to find Yuguang elementary school, on whose grounds reside two Japanese period air raid shelters. They would have been cramped in a real air raid, and couldn't possibly have withstood a direct hit. From there I took Ping115-1 past the airbase. It was a fascinating moment: it is so rare in Taiwan to face an infinity of flat space as desolate as this. Nothing but pineapple plants and fruit trees in every direction, as far as the eye could see. I emerged into a four way intersection and saw down one road was this enigmatic tower. I decided to check it out. Unfortunately, just as I neared the tower, The Call of the Wild and His Baying Hounds burst from under a fence and gave chase. Each hound was the size of a lion and sported eight inch fangs, combat armor, javelins, and a giant warhammer in each paw. Or so it seems when they are chasing you. I immediately broke the sound barrier and, pumping away, soon found myself biking on cobbled ruts, while the dogs, too sensible to chase me over rocks, stopped to watch, laughing, shaking their fists and deprecating my manhood. I am sure that they took one look at my bike and said to themselves: Hmmm, fat guy on 700 x 25 slicks. No way he can ride on those stones. He has to come back to the pavement. Lads! We’ve done treed this boy! Fortunately I did manage to wend my way back to pavement after hiking along the rocky road for a short bit, but I missed my chance to inspect the tower. After getting directions at a local temple, I returned to 185 and turned north, back to the B&B. Along the way I hit this aboriginal wedding, with guests resplendent in aboriginal clothing (video). Wedding guests planning for their future wedding? Snacks. Pork rolled in sticky rice and steamed. Delicious. As I snacked, she took out some ceramics that were gorgeous. Seeing how much I loved them (too bad I can't show you all the pics), she immediately offered to take me up to the artist's ceramics workshop in nearby Jiayi village. We ended the day with my fourth cup of coffee at this little coffee shop that specializes in coffee grown in Pingtung (blog). It is right where 104 crosses 185 (0919975299). On day 2 I stopped at Art Coffee again. 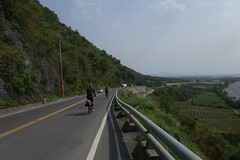 Then it was up to Taiwu Township and the mountains. I was really hoping to get in some mountain riding, but the bike gods were surly this week. Climbing up into the hills. 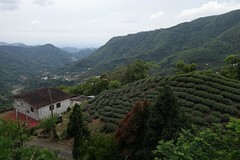 My target was Dawushan B&B (大武山民宿屏東縣泰武鄉武潭村老潭巷40號 886-8- 7920332). It is run by a retired couple. Perched on a ridge at 500 meters, it has wonderful views. The road up is a favorite of local cyclists and it was crowded on Sunday morning. Dinner. The soup was superb. The owner will take you hiking into the mountains if you have time. The view from my window in the morning, alas, included rain. I shifted gears and decided to cross Pingtung County to visit Donggang and another Pingtung playground, Dapengwan Scenic area. Along the way I crossed this railroad line in several places, sometimes converted into a bike path. 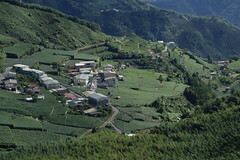 It is a bit of history: the old Taiwan sugar line through the sugar fields of Pingtung. I hadn't been in Dapengwan in a dozen years and so was totally unprepared for the way the area has been transformed. The local government has put in a large educational and administrative center and 16.8 kms of bike paths encircling the lagoon, along with new roads and other facilities. The goal is to create a water playground, according to the brochure I got at the administrative center. It is still in the larval stages at the moment. Fishermen and farmers are still hard at work in the area. Outside the administrative center there is a Fuji bike shop that acts as the rental and repair center for cyclists on the bike paths. Cyclists gear up for a lagoon adventure. From Dapengwan I headed over to Donggang, a hardworking port city with a rich history. Featured here is the imposing gate to the Donglung Temple, one of the numerous temples that crowd the area around the port. Donggang is the site of the famous boat burning festival that occurs every three years. Thanks to Robert Kelly of Pashan for suggesting Donggang. Gaming in front of the Donglung temple. Old friends meet on the bridge. It is a working port crowded with boats of every description. On the way to the Huachiao Fishing Port. I went north to Chaojhou to locate lunch and internet and perhaps visit some local historical sites. Alas, no luck with all three. Along the way I passed the Ba Da Forest Theme Park, whose gate is shown in this image. Words fail me, so I will let the picture tell the story. ...and grabbed another pic of the Basilica. Tomorrow the CWB says the weather will improve. Looking forward to more biking! What if it happened here? We don't need no steenkin' rule of law!